In a fruit jar or a mixing jar, mix the olive oil,vinegar, brown sugar, garlic, Italian season, salt, pepper and pepper flakes. Put the lid on the jar and shake it well. Set the dressing aside, do not refrigerate at this point. Drain the pasta and drizzle some of the olive oil over the pasta to keep it loose. Set the pasta aside, keep at room temperature. Place the vegetables in a large bowl and drizzle the remainder of the olive oil over the vegetables. Sprinkle the salt, pepper, Italian season, over the vegetables and toss to completely cover. Place in a grilling basket and grill on a medium hot grill. Toss the vegetables so they can get a good char. When the vegetables are charred and tender remove from heat. 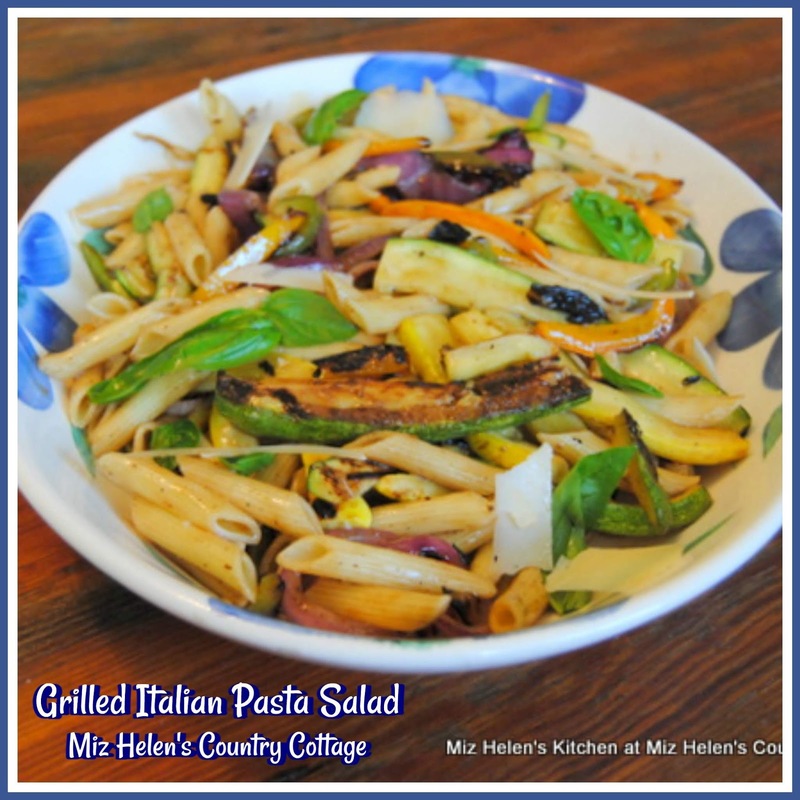 Pour the Penne Pasta into a large mixing bowl and add the grilled vegetables and mix well. add the fresh basil. When the vegetables and pasta are mixed, pour the dressing over the salad and mix well. The longer this salad sits the better it gets. A great make ahead salad. We sure enjoyed having you visit with us today, its always so much fun to have friends stop by when we are grilling. Hope you have a great week and come back to see us real soon! I can't wait to try this Miz Helen, sounds great! Miz Helen, I really love the grilled vegetables with the pasta, and the grill basket is very handy! Love all of those grilled veggies in this salad. Great for a side, vegetarian main, or with some grilled chicken, a great meal to make and have for a week's worth of lunches. On the pasta amount, do you know how many ounces of dry pasta? This looks wonderful. I use 10 to 12 ounces of pasta. Hope you enjoy the salad and thanks so much for stopping by! Hope you are having a great week. Those veggies looks gorgeous and perfect for this pasta! Sounds so good with the vegetables grilled. Thanks so much for sharing with us at Whimsical Wednesdays Link Party!